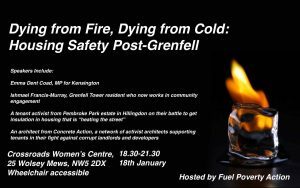 La st Thursday, Fuel Poverty Action hosted an evening of discussion about the cold, fear and poor living conditions faced by residents of many housing estates in the wake of Grenfell. He has devoted the last 7 months to representing the views and rights of residents in the area, and has made a documentary series about the fallout from Grenfell called ‘Failed by the State’. Ruth London, from FPA, said the very same penny pinching, cheating building practices, unaccountability and second rate materials that led to the fire at Grenfell Tower were also causing thousands to die from cold each winter, in poorly insulated flats. “Thousands more high rise residents are now at risk from cold since cladding and insulation have been removed as fire risks, and haven’t been replaced,” she said. “It’s not acceptable if they make things a bit safer in terms of fire but they leave people to freeze. Emma Dent Coad, MP for Kensington spoke about her frustration at the government for not creating and enforcing strict regulations on construction companies before and after Grenfell. She stressed poor government oversight and construction company’s cost-cutting practices as the cause for this poor quality infrastructure. Similar frustrations were raised by Sian Berry, London Assembly Mayor and Green Councillor for Camden, who described her horror at the poor practices of construction companies. “We’ve had heating re-done in an entire estate and we’ve had enormous problems with the quality of the work,” she said. She explained how residents had to work tirelessly to prove that the construction work was inadequate, drawing up lists and calling numerous meetings with councillors. “When a resident complains about mould, they get the classic response that: ‘oh, you’re doing too much washing’ or ‘you’re using your appliances wrong’, when actually it’s the house itself that’s causing the problems,” Berry said. She talked specifically about the Chalcots Estate in Camden which had to be evacuated last year when it was deemed a fire hazard and unsafe for living. “It wasn’t just the cladding at Chalcots that meant it needed to be evacuated, it was also really shoddy internal work,” she explained. Another hot topic at the meeting was landlords’ reluctance to take even basic steps towards improving relations with tenants, even after the atrocities at Grenfell. In some instances, they have refused to foot the bill for replacement cladding or do retroactive reconstruction work on buildings. The meeting was attended by a wide range of people with personal experience of poor housing, or expensive and dysfunctional district heating systems. The panelists’ speeches were followed by an extremely spirited and enthusiastic discussion in which many were vocal in their agreement that the government needs to improve its oversight and regulation of construction companies. Next PostNext Press Release. Shared Warmth: Not for all.